On October 23-27th, 2017, the United Nations Human Rights Council’s Open-ended Intergovernmental Working Group (OEIGWG) for the development of a legally binding treaty on Transnational Corporations (TNC) and other business enterprises (OBE) with respect to human rights met for its third session. The OEIWG examined the “elements” presented by the presidency of the group, assured by Ecuador. The debates focused on the Human Rights obligations of both TNC and States, and in particular TNC responsibilities (as such and for their managers) on the administrative, civil and penal point of view. Debates were also held on access to justice for the victims, issues of jurisdiction (of the headquarter State or of the State where operations take place), as well as on how to set up an international court for TNC and Human Rights, cooperation within and among countries, etc. The outcomes of the session are encouraging. The elements suggested by the presidency where finally approved despite some strong resistance, especially from the European Union which, as a block of 28 countries, was moving the debate on procedural issues instead of on the content of the elements. In any case, the presidency is due to produce a “draft zero” of the Treaty for the 4th session, to be held next year. 200 delegates from civil society across the world came to Geneva to follow the process and express their statements. Historically, their work and presence has been crucial for the elaboration of operational guidelines and the creation of the OEIGWG. In addition, working through a coalition enables NGOs to exert greater influence on norms setting than through individual efforts alone. Their presence was articulated around two main interconnected bodies: (1) The Treaty Alliance, which comprises more than 950 committed networks and campaign groups around the world that collectively help organise advocacy activities in support of developing a binding international instrument to address human rights abuses committed by transnational corporations and other business enterprises. (2) The Global Campaign to Dismantle Corporate Power and Stop Impunity, which was launched in 2012 at the Rio+20 People’s Summit. The launch was preceded by a broad consultation process with movements, networks and organisations from around the world that are fighting against the corporate regime that has captured development models and the architecture of extraordinary privileges and impunity that allow this regime to perpetuate itself. At the time, a Call for Action was also issued with the goal of giving the central role to communities who are resisting the systematic violations and crimes of transnational corporations. 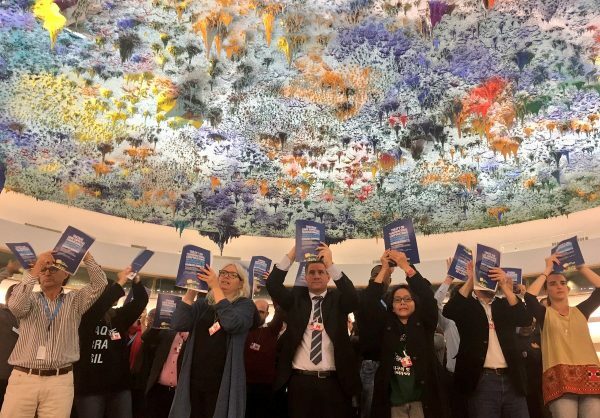 The Global Campaign is organised around three main actions: the elaboration of the so-called People’s Treaty, the permanent people’s tribunal, and the participation in each session of the OEIGWG on TNC and OBE to pressure governments to keep the process of building a Transnational Corporations Treaty. After several years of work, they prepared a Treaty text proposal as a contribution to this third session. The ICCA Consortium has been considering how best to support the defenders of the commons and ICCAs and these initiatives are powerfully in alignment. During the forthcoming Consortium’s XIth General Assembly in Geneva a draft policy on ICCAs as “No Go” for destructive development and safe haven for defenders of the commons will be discussed and possibly approuved. The current draft of the policy states that “voluntary commitments in specific situations as well as legally binding obligations at national, regional and international levels are potentially relevant in different contexts and can be mutually reinforcing; precise strategies should be decided on a case-by-case basis.” The Consortium now has to decide on its strategic next steps to support ICCAs on the face of devastation caused by TNC… which currently continue with full impunity.